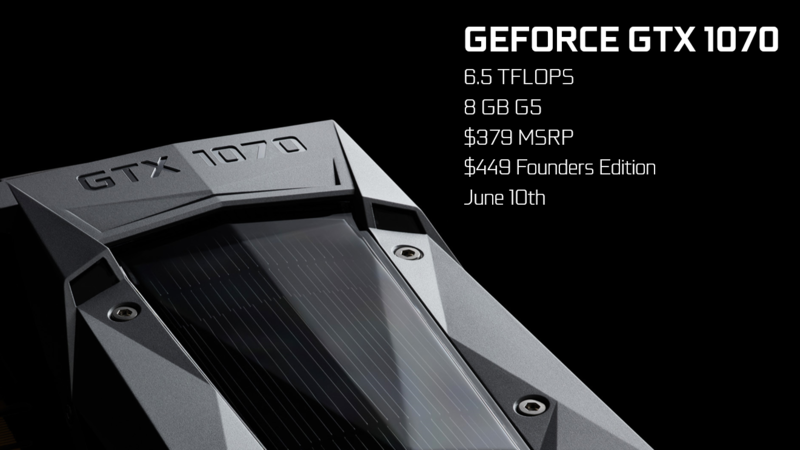 The Nvidia GeForce GTX 1070 is the second fastest Pascal based graphics card in mid May 2016. It is a high-end desktop graphics card. The mobile pendant is also called GeForce GTX 1070, but features more shaders and a lower core clock (see this page for details on the laptop version of the GTX 1070). Both cards are based on a cut down GP104 chip as the GTX 1080 and manufactured in 16 nm FinFET at TSMC. More details on the Pascal architecture including all features and comparisons to Maxwell, can be found here. Compared to the GTX1080, the GTX1070 features less CUDA cores (1920 versus 2560) that are clocked a bit lower (maximum Boost 1683 versus 1733). Instead of the new GDDR5X, the GTX 1070 uses slower GDDR5 graphics memory - but still 8 GB. The TDP is also reduced from 180 Watt to 150 Watt. The performance of the GTX 1070 is between the old GTX 980 Ti and the GTX 1080. Therefore, gaming in 4k at high details is possible with the card and also VR gaming is possible. The Nvidia GeForce GTX 1070 with the Max-Q design is a mobile high-end GPU from the Pascal series. It is designed for thin and light laptops and about 10-15% slower than a regular GTX 1070 for laptops based on the cooling capabilities. The base frequency (1101-1215 MHz) is also much lower than on the regular GTX 1070 (1433 MHz, at least -10%) and the Boost (1265-1379 MHz) is also much lower compared to 1645 MHz (at least -6%) for the regular GTX 1070. The memory clock, however, is identical. The clock is not the only difference compared to the regular GTX 1070 though. The drivers for the Max-Q version were optimized for efficiency (and not performance; only for Max-Q models), there are optimized voltage converters for 1V operation, high-end cooling methods, and a 40 dB limit for the fan noise (with clock adjustments to ensure this at all times). The power consumption of the Max-Q design is notably lower than the normal GTX 1070 for laptops and ranges between 80 and 90 Watt (TGP) according to Nvidia.